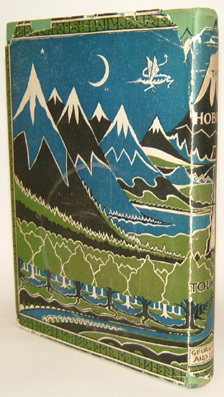 J. R. R. TOLKIEN - THE HOBBIT, OR THERE AND BACK AGAIN First edition, first printing 1937. 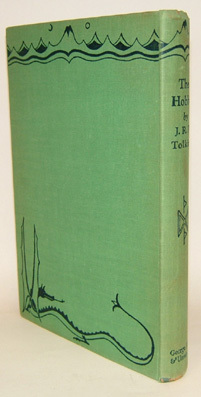 Published by George Allen and Unwin, London. 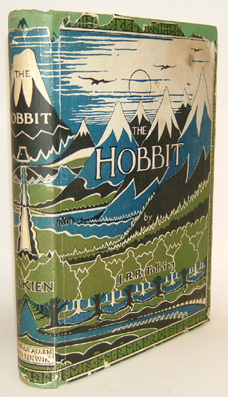 First edition, first printing 1937. 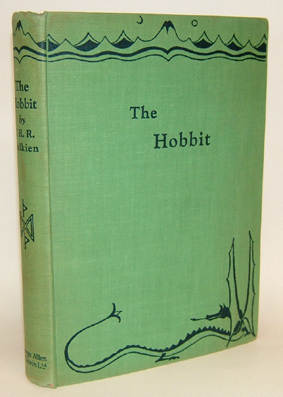 Published by George Allen and Unwin, London. 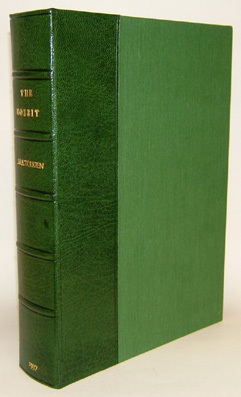 THE BINDING : Bound in the publisher‘s original green cloth boards with dark blue illustrations and titles to all panels. The boards are lovely and clean with only very light offsetting to small areas of the spine. The binding leans slightly. The spine tips are worn with loss to the cloth at the very ends (not affecting or anywhere near the lettering). The cloth at the corners are also worn to the tips but again only very small and inoffensive. A lovely clean, bright and tight example. THE CONTENTS : The contents are entirely complete with no loose or torn pages and no stamps. 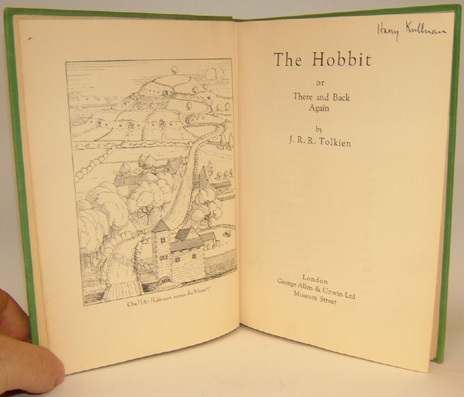 A previous owner has written their name to the top right of the title page otherwise there are no further inscriptions. The pages are exceptionally clean and bright with none of the heavy foxing or thumbing usually encountered with this title. 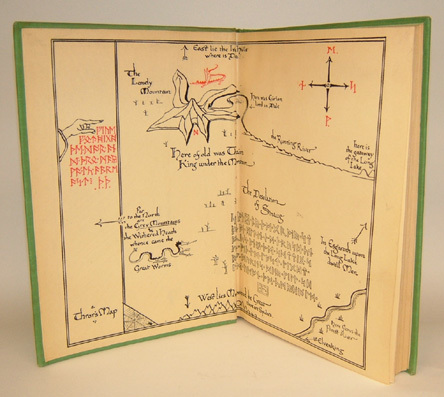 All of Tolkien's black and white illustrations are present as called for and in FINE condition. 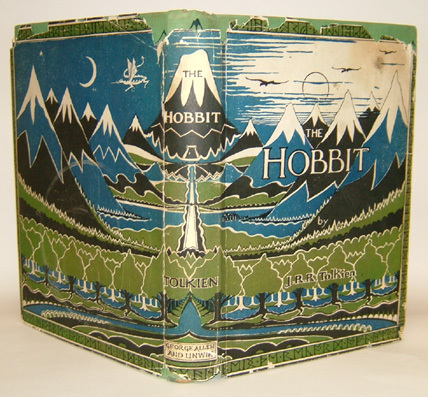 The endpapers are original and the hinges tight and unworn. The green top stain to the text block edge has faded and is dusty. A lovely copy much better than the majority of copies that come onto the market. THE DUSTWRAPPER : The original and correct first issue dustwrapper is genuine and original to the book. 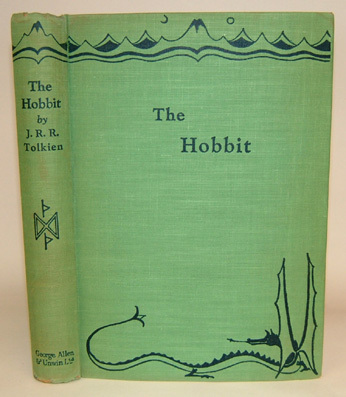 It is chipped in several places to the edges but importantly not affecting any titles or lettering. As one would expect there is some soiling and rubbing the worst being a mark to the top right corner of the front panel. On the rear flap, as called for the word ’Dodgeson’ has had the ‘e’ crossed through in ink confirming first issue status. The original publisher‘s price of 7s. 6d net has not been clipped from the front flap. The reverse of the wrapper has had a couple of archival tissue repairs to closed tears including one to the length of the spine fold, this is very subtle and only visible on close examination of the blank reverse. 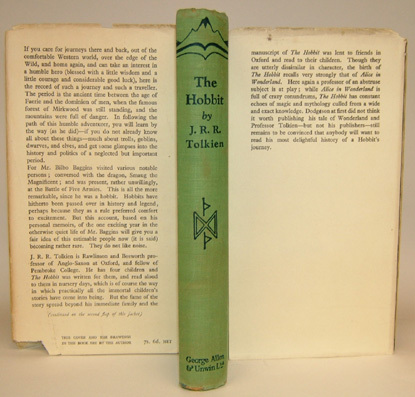 A presentable example of the true first edition, first issue dustwrapper. 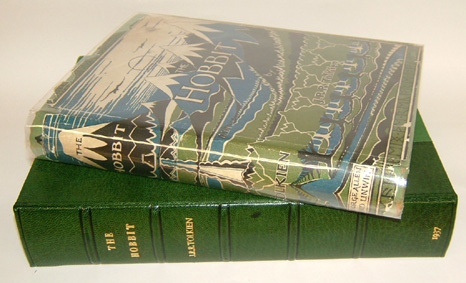 To compliment and protect the book it is now housed in a purpose made felt lined presentation box with the titles stamped in gilt on the green leather spine.